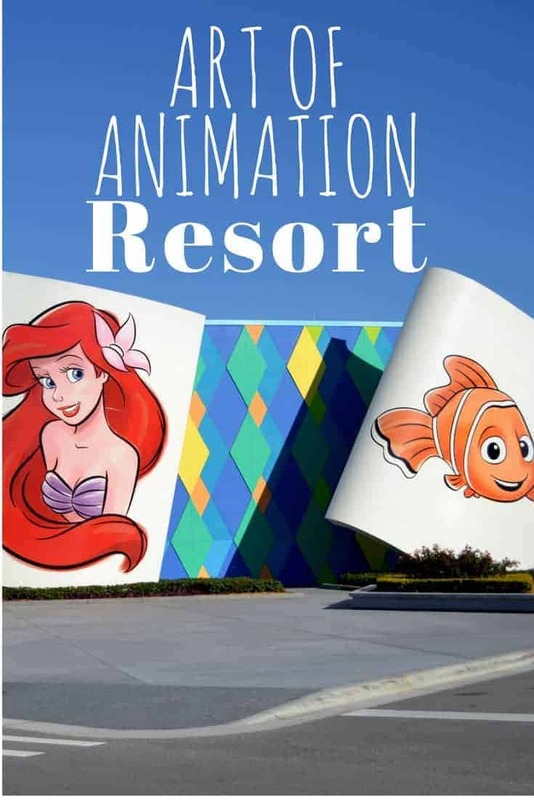 If you are looking for a reasonable-priced resort to stay that offers a little more than the typical value resort but not as pricey as the moderate, Art of Animation Resort might just be what you need. This is one of Disney’s newest resorts and is themed with popular characters from Disney movies and has standard rooms as well as family suites. 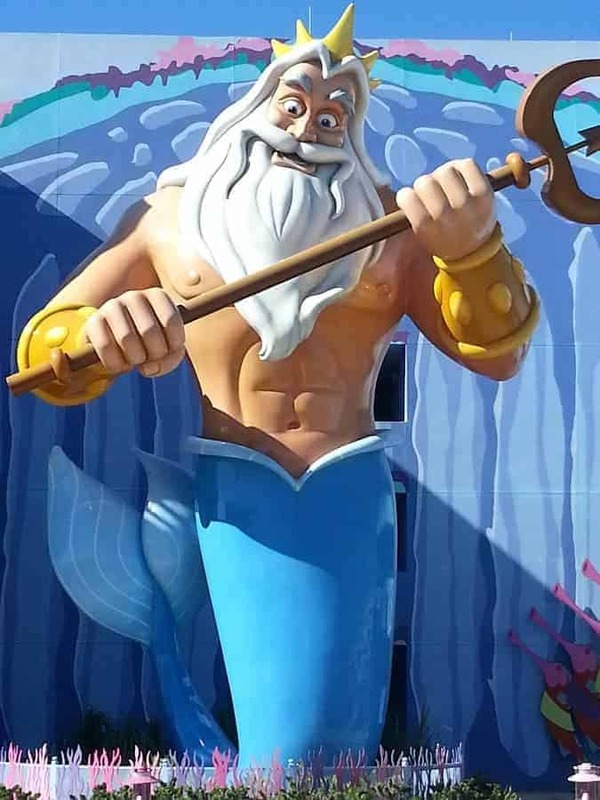 Art of Animation Resort has four differently themed sections: Finding Nemo, Cars, The Lion King and The Little Mermaid. 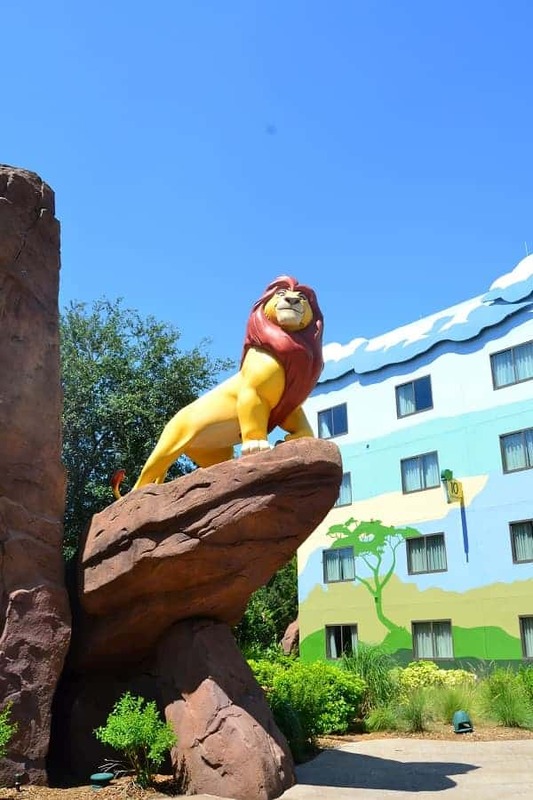 Three of the four sections (Finding Nemo, Cars, The Lion King) have family suites that will sleep up to 6 people, while The Little Mermaid rooms comfortably sleep up to 4. 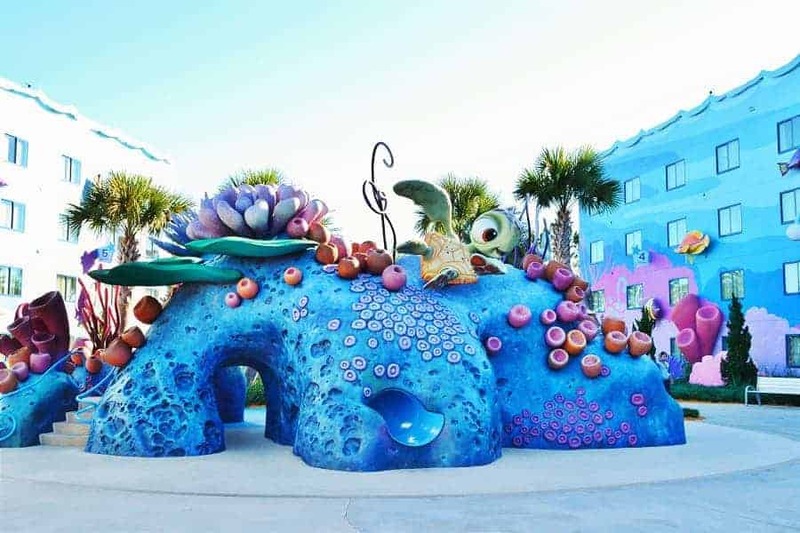 What makes the Art of Animation Resort better than the other Value resorts is the Big Blue Pool. 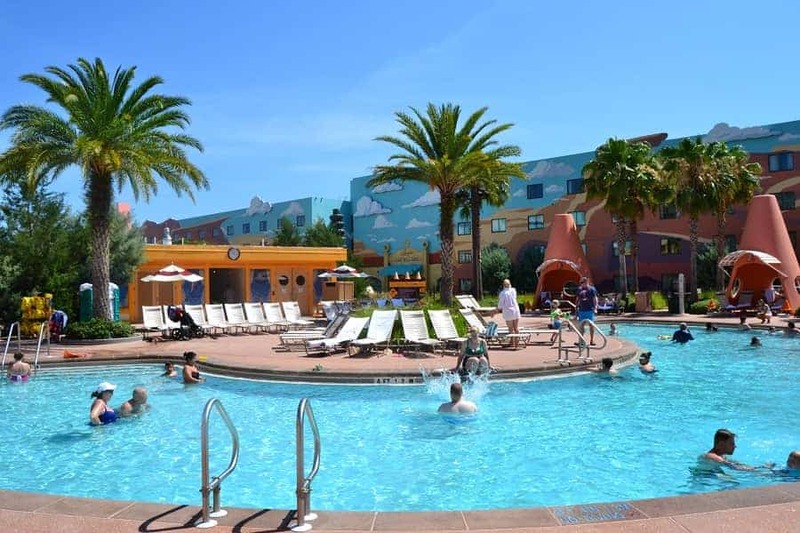 It is the largest pool among the Disney resorts and it is spectacular. It features a zero-entry design and state-of-the-art underwater speakers! The Big Blue Pool also has an adjacent kid water play area that is a big hit for the preschool kids. Lots of sprouting water fountains and Nemo friends for the kids to play with. On the other side of the pool and kids water area is Righteous Reef playground. It is a great place to let the kids work off some energy. Kids from ages of 2-12 will enjoy the multiple slides and caves! Many of the value resort pools are lack-luster in my opinion, but Disney really did it right with the Big Blue Pool. Besides the Big Blue pool, there are two other smaller pools located near the Cars Suites and Little Mermaid Rooms. While not as large, they are themed and just as nicely decorated. The hub at Disney Art of Animation Resort is in the main check in area. You can spend time looking at all the sketch artwork on the wall or might even catch a Disney Cast Member teaching a drawing class right inside the lobby! Just past guest services, you will find the Pixel Play Arcade. There are many games to keep the kids busy and it has a lounging spot for parents to kick back while the kids play. Also located just off the main lobby is the Ink & Paint Shop Gift Shop (really large with lots of good stuff). One thing that I think Art of Animation has done much better than most is their quick service restaurant. Land of Flavors has really great choices to be a quick service restaurant. You will find everything from Brats & sauerkraut to Broiled Salmon. Besides the standard Disney desserts, the Art of Animation quick service restaurant has a gelato bar and makes smoothies! If there is one thing you should get here it is the Pineapple Frost. I am hearing news that they might even be getting traditional Dole Whip! 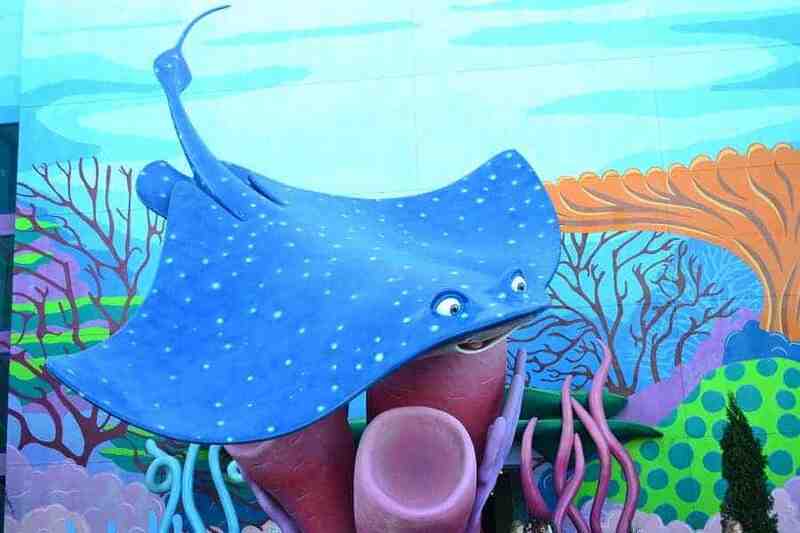 Have you been to Art of Animation Resort? In which section did you stay?